Take your Mountain escape to new heights. Fly over the slopes and backcountry of Carosello 3000. Soar over snowy peaks. Let out a liberating scream over the Livigno valley. Your Sky Experience will be recorded using various HD action cams. These images will be used to make a video for you to take home. The Sky Experience takes place every day throughout the winter. The meeting point for the Sky Experience is at the top of the San Rocco Carosello 3000 gondola. Landing takes place on the piste between the Amerikan ski lift and the Carosello 3000 San Rocco gondola. 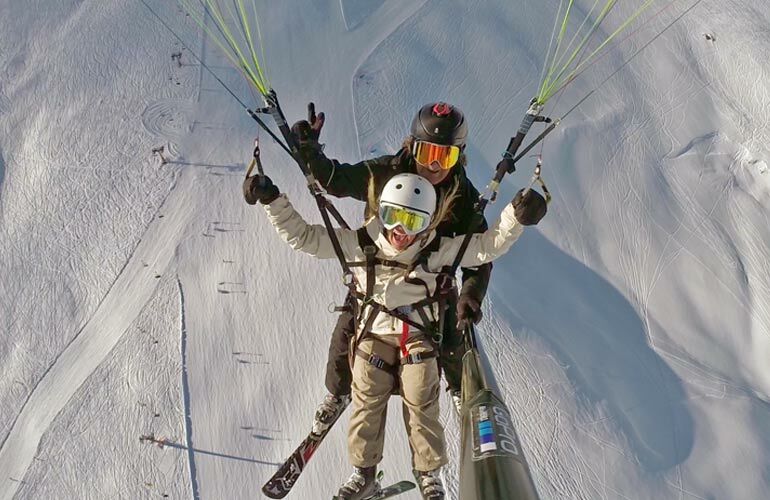 Fabio Conti has been a paragliding pilot since 1990 and has been qualified to fly a two-seater since 1995. He has flown in the skies of Europe and Australia, clocking up more than 5,000 hours of flight time. He loves all boardsports, especially snowboarding on fresh powder. A few years ago he found his winter paradise at Carosello 3000 - Livigno. The cost of the Sky Experience is €100.00 per person. The Sky Experience is an exclusive event with a limited number of places. An average of 50 people can fly per week. Book now to secure your place before they're all gone. The Sky Experience is a really safe activity. We only fly when the weather and wind conditions are safe. The Sky Experience is great for all ages. We have flown with 5-year-old kids and people over 80 years old. The passenger's weight must not exceed 100 kg. You wear your skis when flying. If you're a snowboarder or non-skier you can fly without skis or you can use some mini-skis we have available. When you're flying you don't need your smartphone in your hand (you might drop it!) 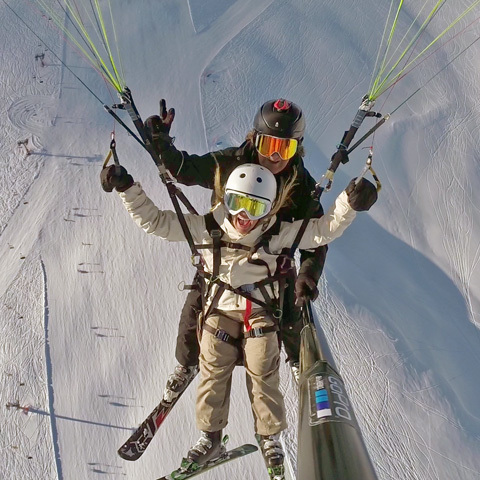 There are HD action cams on the paraglider to capture photos and videos of your experience. The Sky Experience is a great idea for a surprise, for stag and hen trips and, of course, to tell someone you love them or for an unforgettable marriage proposal. The Sky Experience is almost always fully-booked. Book well in advance. Ski on remote routes and enjoy an Alpine snack while listening to the stories of a local skier.